"I hate him as I do hellpains, yet I must show my love—as I think on vengeance." Emil Jannings climbs higher and higher in my esteem all the time. From his witty Mephistopheles in Faust, to the aging doorman in The Last Laugh, to the title character here, he displays a chameleon-like acting shown by no modern actor, with the possible exception of Meryl Streep. The film follows the outline of Shakespeare's play quite well, though obviously in significantly abbreviated form. 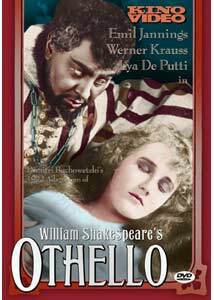 Othello (Jannings) is a Moor, a general of the armies of Venice. He is both in need of a lieutenant and in want of a wife. The latter is supplied by Desdemona (Ica von Lenkeffy), the daughter of a very unhappy nobleman. Othello selects Cassio as his lieutenant, passing over his friend Iago (Werner Krauss). That proves to have been a fateful decision, for Iago puts into operation a scheme for vengeance that leaves nearly everyone dead. The plan revolves around using Othello's hot temper and jealousy to make it appear that Desdemona is cheating with Cassio. Before long, the "green-eyed monster"—jealousy—makes its appearance, and tragedy ensues. Viewing this version of the story, and knowing that it was made in Weimar Germany, makes one give pause before the emphasis on the issue of miscegenation. Most of Iago's other motives are stripped away besides the promotion, making his hatred seem as if prompted by disgust at the intermarriage of Desdemona and the Moor. Brabantio's petitions to the Doge are likewise given great emphasis in this adaptation, giving one a quiver when one thinks about where these doctrines of racial purity would take Germany in the next few decades. Jannings is utterly imposing as Othello, playing the part to the hilt. Other reviews have criticized him for overacting here, but I don't think that's the case at all. The character is supposed to be somewhat flamboyant and easily enraged. Jannings captures that aspect nicely, as well as the Moor's quieter moments of affection with Desdemona. Krauss, hardly recognizable to those familiar with him only as Dr. Caligari, makes a fully loathsome Iago. He revels almost too much in his wickedness, setting up not only Cassio but his trusting friend Roderigo for disgrace and humiliation. Von Lenkeffy is rather one-note in her portrayal of Desdemona, but she doesn't have a great deal to work with here, since her screen time is quite minimal. The production values are excellent, with opulent sets capturing sixteenth-century Venice quite nicely. The camera work is excellent, with a wide range of shots and skillful use of closeups at appropriate times. The intertitles appear to be from the 1920s and are quite artistically done. In all, a superior production that suffers little from cutting the dialogue down to a bare minimum. Image Transfer Review: The original full-frame picture is good. Plenty of detail is visible in the sumptuous costuming and sets. While there is the expected flicker, the transfer is quite good. The source print has a number of defects, including a plethora of speckling, scratches and other minor problems. In addition, the opening titles jitter slightly. There are numerous abrupt splices and jumps that occasionally test the viewer's patience. However, if this is the best condition that the film survives in, then so be it. Audio Transfer Review: The 2.0 piano score is quite appropriate for the film, though I would much prefer the traditional organ. Jon G. Mirsalis, who also plays for the supplement films, does an excellent job of making his original score meld with the film. The sound reproduction is excellent, with very good range and without and distortion, noise or hiss. Quite satisfactory indeed. Extras Review: Other than some brief production notes by Douglas Brode, author of Shakespeare in the Movies, the only extras are four early short versions of Shakespeare plays, which are a very nice extra indeed. First up is a one-minute Duel Scene from Macbeth, shot in 1905 by Billy Bitzer. He would later go on to become D.W. Griffith's primary cameraman for all of his great films, including Birth of a Nation and Intolerance, so it's very nice to see his early work preserved here. Obviously, from the length there's nothing more than the duel between Macbeth and Macduff, but it's in good condition. A five-minute version of Taming of the Shrew from 1908 follows. This is directed by Griffith himself, and is quite hilarious. The slapstick and knockabout are nearly nonstop, and highly enjoyable. Griffith manages to encapsulate the entire play very well into its brief running time. The final two films are later, modern-dress versions of Shakespeare plays. The first is a 1910 French film, Romeo Turns Bandit, in Pathecolor. Precious little remains of the color in some scenes, while it is quite intense in others. The story has almost nothing to do with Shakespeare other than borrowing the names (and getting them wrong, referring to Romeo as a Capulet and Juliet as a Montague). Rather tedious, the story revolves around Romeo becoming a brigand after denied his Juliet; he kidnaps her, steals the ransom and they live happily ever after. Silly and tedious, this is at best a curiosity piece. Wrapping up the shorts is a two-reel Danish film, Desdemona, made in 1911. This concerns a struggling actor and actress; an unwelcome suitor sows seeds of distrust between them. The film culminates in them playing a scene from Othello. Decidedly odd in its approach to storytelling, this film rewards repeated viewings. Since the picture is extremely fuzzy with large grain, I suspect it's a blowup of an 8mm print, which doesn't help the clarity one whit. An attractive transfer of a marginal print, with fine performances by Jannings and Kraus. Some very nice extras make this a delightful package for those interested in silent Shakespeare.